Assigns globally unique id to each registered schema. Allocated ids are guaranteed to be monotonically increasing but not necessarily consecutive, and ZooKeeper is used to to help maintain this guarantee. Kafka provides the durable backend, and functions as a write-ahead changelog for the state of the Schema Registry and the schemas it contains. The Schema Registry is designed to be distributed, with single-master architecture, and ZooKeeper coordinates master election. Schema ids are allocated in batches by the current Schema Registry master and handed out one by one to newly registered schemas. /<schema.registry.zk.namespace>/schema_id_counter path stores the upper bound on the current id batch, and new batch allocation is triggered by both master election and exhaustion of the current batch. This batch allocation helps guard against potential zombie-master scenarios, (for example, if the previous master had a GC pause that lasted longer than the ZooKeeper timeout, triggering master reelection). 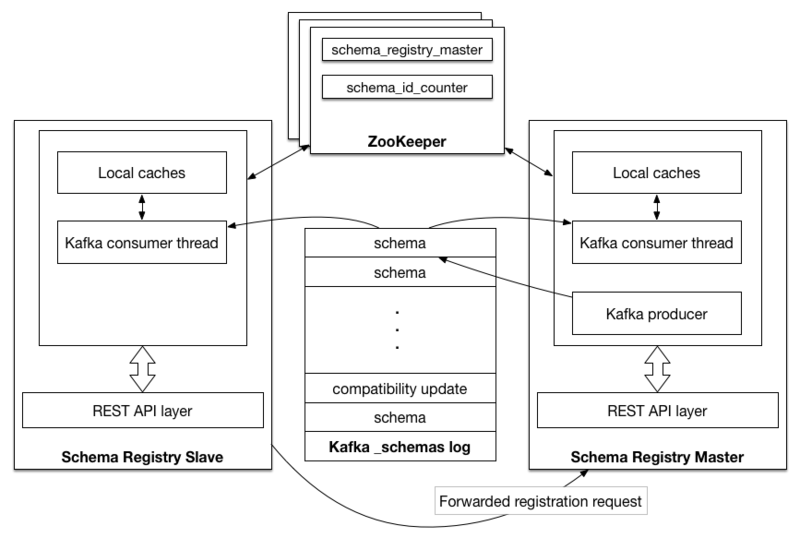 Kafka is used as the Schema Registry storage backend. The special Kafka topic <kafkastore.topic> (default _schemas), with a single partition, is used as a highly available write ahead log. All schemas, subject/version and id metadata, and compatibility settings are appended as messages to this log. A Schema Registry instance therefore both produces and consumes messages under the _schemas topic. It produces messages to the log when, for example, new schemas are registered under a subject, or when updates to compatibility settings are registered. The Schema Registry consumes from the _schemas log in a background thread, and updates its local caches on consumption of each new _schemas message to reflect the newly added schema or compatibility setting. Updating local state from the Kafka log in this manner ensures durability, ordering, and easy recoverability. The Schema Registry is designed to work as a distributed service using single master architecture. In this configuration, at most one Schema Registry instance is master at any given moment (ignoring pathological ‘zombie masters’). Only the master is capable of publishing writes to the underlying Kafka log, but all nodes are capable of directly serving read requests. Slave nodes serve registration requests indirectly by simply forwarding them to the current master, and returning the response supplied by the master. The current master is maintained as data in the ephemeral node on the /<schema.registry.zk.namespace>/schema_registry_master path in ZooKeeper. Schema Registry nodes listen to data change and deletion events on this path, and shutdown or failure of the master process triggers each node with master.eligibility=true to participate in a new round of election. Master election is a simple ‘first writer wins’ policy: the first node to successfully write its own data to /<schema.registry.zk.namespace>/schema_registry_master is the new master. The Schema Registry is also designed for multi-colo configuration. See Backup and Restore for more details.